In the world of IT, there is a continuous struggle against the tide to make sure a business is running smoothly. That precious break can give IT gurus a much-needed moment to take their foot off the throttle and take stock of what lies ahead. After a year of extensive cyber threats, it’s clear that a multifarious attack could happen at any time on nearly any part of the network. Highly-publicized data breaches have catapulted security to the top spot in the survey with over 25 percent of respondents highlighting it as a major concern. As cyber convicts become more sophisticated and better-funded, the reality is that we are simply not doing enough to keep up. Heading into 2018, the focus for security needs to be data protection. In the security category, data breaches stole first place while securely transferring data ranked at number two. End users often won’t consider the risks when selecting a method to transfer information and unsurprisingly data, i.e. mid-transit, has the highest probability of loss. Scheduling your approach to security is important and will help you understand where your system is weakest. There are massive changes to the way data can be adequately transferred. Businesses will find privacy at the forefront of their agendas. For technological giants such as Google and Amazon, as well as businesses using services like Dropbox, there can be serious insinuations for companies storing data long after it has been transmitted. In any situation, keeping up with evolving security threats while also meeting new privacy standards will prove to be one of the biggest challenges of 2018. In light of these changes, another matter highlighted by research as a concern was found to be compliance. Whether it is the healthcare, financial, or legal sectors, many industries require full transparency and must secure their business-critical data. With the introduction of new data privacy regulations, all business will have to comprehend and obey with what is being asked of them. An awareness and education program could well benefit an organization to help share the burden of compliance. 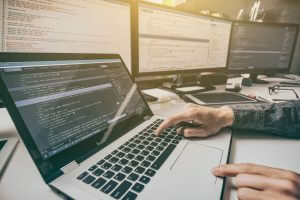 It seems that IT teams are also looking to revolutionize and need to tackle issues in application performance and monitoring. As networks become increasingly demanding and dispersed across many platforms and devices, every aspect of the infrastructure, from applications, servers, connected devices and virtual environments, must all be monitored in order to optimize efficiency and highlight any performance issues. As advances in technology continue to push on at an exceptional rate, the invasion of new devices such as smart watches and fitness bands as well as the streaming of high-bandwidth content will put pressure on IT pros. When arraying new technologies, handling user devices, and ensuring new technologies are compatible with the existing infrastructure, a clear plan of action must be put in place. This will make sure the IT department isn’t left gasping at the starting line. In addition to precise planning, implementing automated systems to tackle repetitive tasks will open up your time to spend on running IT infrastructure and business-critical setups. Training staff when new technologies are implemented could save time and troubles later down the line, increasing efficiency and productivity while ensuring that work forces are making the most of the technology available to them. It is clear that IT professionals have a lot on their plate with a broad range of concerns that include data protection and management, storage, device management, automation, and reporting. The simplest solution is this – don’t attempt everything. Decide what is achievable for your department and follow through with your improvements.